What are Some Carboniferous Tetrapods? 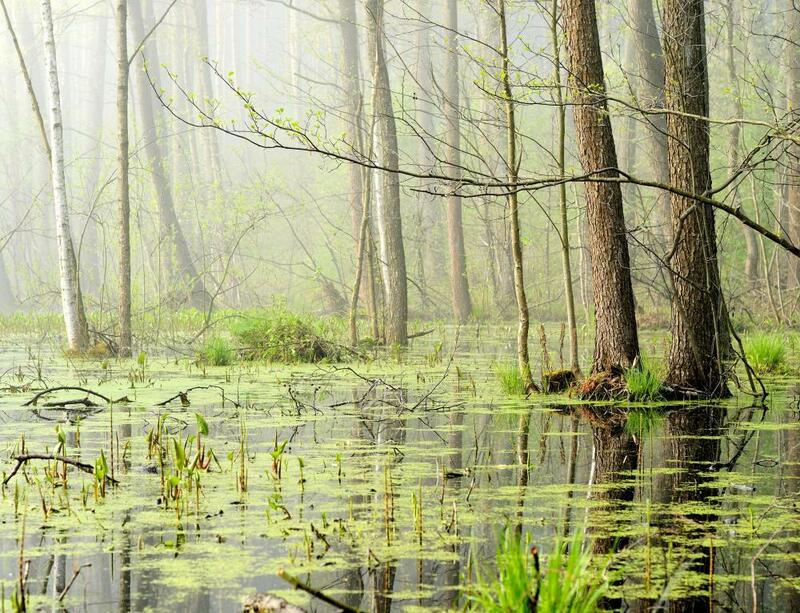 Swamps flourished during the Carboniferous period. Carboniferous tetrapods are four-legged animals that lived during the Carboniferous period, between 359 and 299 million years ago. These animals, including amphibians, reptiles, and basal tetrapods, initially evolved about 365 million years ago, at the very end of the Devonian period. They evolved from lobe-finned fish, such as the living coelocanth. 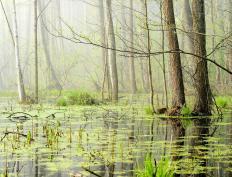 At the time, the world was very warm and wet, and covered in shallow, tree-choked swamps. Insect life and foliage was abundant on the land, which the Carboniferous tetrapods could feast on in the essential absence of predators. The first Carboniferous tetrapods were extremely primitive, and some are called "fishapods" because their characteristics are a mix between fish and tetrapods. These animals include Eusthenopteron, Panderichthys, and Tiktaalik. Panderichthys is the first known fish to have spiracles on the top of its head, structures that would let it breathe from the water while buried in the mud. These spiracles eventually evolved into the stirrup bone of our inner ear. Panderichthys had a variety of other transitional features, such as strong girdles supporting its fins, suggesting that it used them to move through shallow mud. It also had a large, tetrapod-like head. Tikaalik was the first fish fossil to demonstrate arm-like skeletal structures including a shoulder, elbow, and wrist. Sometime around 365 million years ago, the first tetrapods emerged with recognizable limbs. Unlike the fishapods mentioned before, animals like Acanthostega and Ichthyostega are solidly placed in superclass Tetrapoda -- like all living tetrapods and descendants of tetrapods, such as ourselves -- the earliest yet discovered animals to bear this distinction. These animals are thought to have initially evolved legs for purposes other than walking on land -- instead, they were used to navigate through shallow, muddy swamps. Ichythostega had seven digits while Acanthostega had eight -- abnormalities that were rarely repeated again in the history of tetrapod evolution. Between the earliest Carboniferous tetrapods about 359 million years ago until a later stage of development 240 million years ago, there are very few tetrapod fossils. This phenomenon is known as Romer's Gap, named after paleontologist Dr. Alfred Romer. When the gap ends, true amphibians appear for the first time, including various temnospondyls and anthracosaurs. These Carboniferous tetrapods, like the ubiquitous Eryops would become the first large animals to rule the land. What Does a Vertebrate Paleontologist Do? What are Some Carboniferous Organisms? What are the Major Groups of Tetrapods?